After a great year of competition, 18 year old Zane Schweitzer charges his way through to the Final and puts on a dominant performance to secure an emotional win at the Hawaii Island Finals. The day dawned glassy, with clean 4 – 5ft surf at Honoli’i providing ideal conditions for start of the prestigious Main event of the Hawaii Island Finals. With 32 of the very best athletes in the world now battling it out for the event title and to improve on their overall standings on the 2011 Stand Up World Tour, the pressure is on to make the most of the beautiful conditions on offer at Honoli’i. The Hawaii Island Finals opened this weekend at the Naniloa Volcanoes Resort, as the very best Stand Up Paddlesurfers in the world descended upon the beautiful Big Island for the climactic final event of 2011, the Hawaii Island Finals. Connor Wins the Overall Title in Fiji!!! 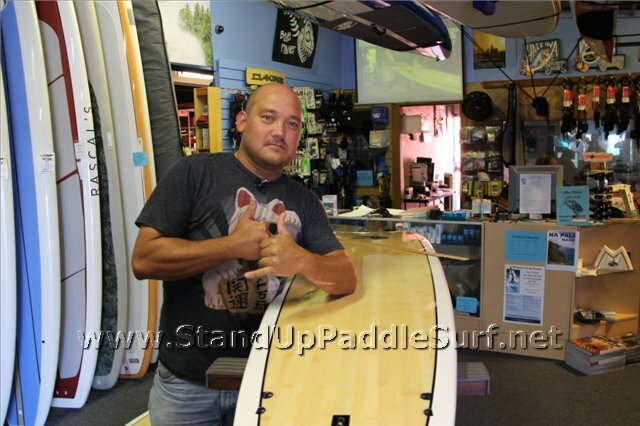 I was at Blue Planet Surf checking out their new line of SUP and surfboards and was able to get Len Barrow from the Zen Waterman Blog share his knowledge on bottom contours and configurations on surfboards and SUP surfing boards. Len explains vee, concaves and gives some history on what has brought us to the modern surfboard bottoms. This was sent to us via email by Karen Baxter. During this past year Connor put together some YouTube videos I wanted to share. Please enjoy – and pass them along to anyone else you think will enjoy. Thanks so much!! In a dramatic close to the Namotu World Paddle Challenge presented by Air Pacific, a final tie break was held to decide the final overall results for the event for both 1st and 3rd places. 19 year old, 2 x Stand Up Paddlesurfing Wolrd Champion and second place finisher in the Long distance, Kai Lenny storms to victory at the challenging Surf Slalom race of the Namotu World Paddle Challenge Fiji, presented by Air Pacific. Dan Gavere surfs the wake of a sternwheeler traveling thru the Columbia Gorge in Oregon/Washington on a Starboard Big EZ and the 2012 prototype Ace 14′x25″. This goes to show you can find waves in very unique places. This article was originally published at the Zen Waterman Blog. It’s been a while since our unlimited board test, where I said we would soon organize a test of 12′6″ and 14′ boards. My friend Scotty had two 12′6 Hobie race boards and a Bark that he wanted to comparison test. I brought four more 12′6’s for a total of 7 boards to test, which worked out perfectly as seven testers showed up bright and early on a Saturday morning (Nov. 6th, 2011) to go through the rigorous 14 laps needed to test all the boards. Photos and specs of the individual boards are shown below. Unfortunately there were some wind gusts that affected times of the individual runs but because each board was tested in each run, these variations in conditions should average out over the results. Also, some of us had to run 8 rounds as someone tested the same board twice somewhere along the way, which threw everything off a little but in the end everyone toughed it out and tested all seven boards. You are currently browsing the Stand Up Paddle Surfing in Hawaii - StandUpPaddleSurf.net weblog archives for the month November, 2011.